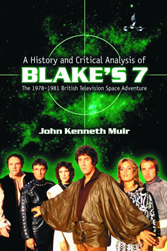 John Kenneth Muir's Reflections on Cult Movies and Classic TV: Blake's 7 to be re-booted next? IndieWire is reporting that Casino Royale (2006) director Martin Campbell has signed a deal to launch a TV re-boot of Blake’s 7 (1978 – 1981), the cult-TV series concerning a band of space rebels fighting a totalitarian Federation from aboard an alien ship of incredible technology, the Liberator. So, if everything works out, we’ll have Blake’s 7, and a re-boot of Space: 1999, called Space: 2099 on the tube at the same time. Of course, I’ve read probably five or six times over the last decade about attempts to re-launch Blake’s 7, either as a cartoon, a film, or a new TV series, and nothing ever seems to happen. I wonder if this attempt will be any different. And as I noted in an interview on Genre-tainment last week, the problem with rebooting Blake’s 7 now is that Firefly (2002) – a great series – already revived and reflected many aspects of the Terry Nation legend. So the new Blake’s 7 will not only need to genuflect to the original program, it will need to stake out territory that differentiates itself from Firefly. I just wrote a post about remakes here on the blog, and noted the reasons why they aren’t always desirable. But I also wrote about the fact that I’ll review each remake on a case-by-case basis. I stick by that. Also, I did write, way back in 1999 -- in my book about Blake’s 7 -- that a big-budget remake with new special effects and a focus on the Dirty Dozen/Robin Hood aspects of the legend could indeed prove pretty amazing. Furthermore, I deeply miss space adventure on television. It’s been absent since the cancellation of SGU (2009 – 2011), and thus the thought that either Space:2099 or Blake’s 7 – or both – could be airing soon fills me with more hope than despair…at least at this point. If you’re interested in learning more about the original Blake’s 7, check out my book on the subject, available here. I think a closer comparison to Blake's 7 would be Farscape. The crew of outlaws spent most of their four seasons on the run from the Peacekeepers and the two lead character were also killed at the end of the fourth season, just like the crew of B7 at S4's conclusion. I agree with you that Farscape also had some similarities to Blake's 7. Definitely so. But Firefly (Serenity) and Blake's 7 both had installments about a totalitarian government attempting to pacify its populace, for interest. I see the commonality primarily in the depiction of an overweening government usurping the power of the individual and the consequent rebellion of said individual. Not getting my hopes up, yet. As you have pointed out, we've had years of talk regarding the resurrection of the property. And yet nothing has happened. I agree with you. I've read so many times about the return of Blake's 7 that I'm not counting on this incarnation yet. It's promising that Campbell is involved, and I hope his premise makes the difference from a failed project and a realized one! Blake's 7 and Firefly are quite a bit alike. To me the difference is that Blake's 7 is great, while Firefly is awful (and I've tried three times to "get into it"). No love for Firefly, huh? I really loved that show, so we disagree a bit there. I too am a "HUGE" fan of Avon. There is no other way to put it. "Get her out of here! I was rather enjoying that." And I was on the floor. Like you, I hope the remake keeps him in the shadows... as it were. John I am happy about Space:1999 being rebooted as Space:2099 hopefully it will be done respectful of the '70s original as we discussed in a prior post. However, if it isn't we always have the original[Battlestar Galactica(1978-1980) :) v. (2003-2009) :( ]. Blake 7's descendant must Firefly, I wonder if Joss Whedon is a Blake 7 fan. Also, Gene Roddenberry's Andromeda. However, it's ancestor must be Star Wars(1977) with Han Solo, Chewy, Luke, Ben, Leia, C3PO and R2D2 in the Millennium Falcon. After the "Thundarr The Barbarian" cartoon, my next favorite obscure TV show from childhood was "Blake's 7." My local PBS station began running the series in the mid-1980s, when I was a teenager growing up in California. Despite never much liking "Star Trek" myself, I was instantly hooked on the show. And of course, the series' conclusion completely blew me away the first time I saw it back then. The Avon character, and the evolution of his relationship with Servelan, was what grabbed me most. Fifteen years later, when I lived in worked in London as an adult, I bought the entire series on videocassette, before it was available on DVD even in Britain. I enjoyed re-watching the show then, but the 'wonkiness' of the sets (and some costuming) was more obvious than it had been to me as a kid when I had watched a somewhat fuzzier broadcast transmission of the show on a much smaller TV. While the ending of the show continued to be trumpeted in Britain even when I lived there as one of the "best endings ever" to any TV show, my British friends were otherwise totally astounded that I, an American from California, had ever heard of it, let alone seen every episode. To them, "Blake's 7" was a notoriously cheap-looking kids show from the 1970s. I'd heard about several potential re-boots over the years as well, and even bought an audio CD once of a new "Blake's 7" radio play featuring Paul Darrow that was the fruit of one of those efforts, I think. The idea that intrigued me most was re-doing the show as an animated series, but using the original episodes as the audio tracks, thereby preserving Paul Darrow's performance as Avon and Jacqueline Pearce's Servelan (among others), while allowing the script writers' original science fiction vision to be more fully realized on screen. (No more off-screen alien invasion, perhaps?) But that was probably the least commercially viable idea of them all, unfortunately.